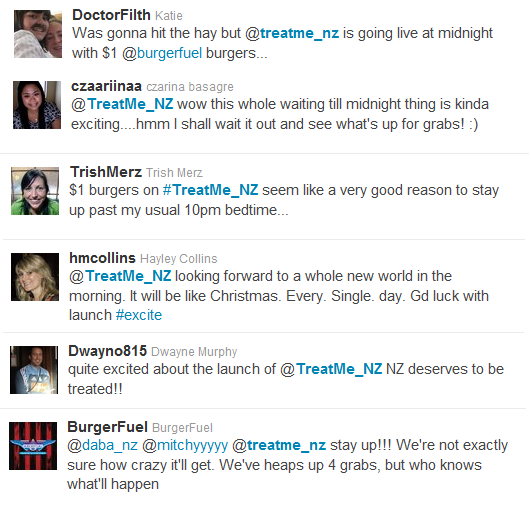 That’s right, after launching into the daily deal space last year with their one day sales, TradeMe are now launching into the group buying space with the upcoming launch of TreatMe on March 22nd 2011. The will be initially launching in the Auckland, Wellington and Christchurch areas, and hopefully will quickly expand to other regions. So what does this mean for the group buying space? Only time will tell really. GrabOne seem to have the market pretty well covered locally.. Australian giant Cudo is preparing for a launch in NZ soon, with TV advertising now taking place. Spreets and Groupy are still going strong. The worlds largest (and first) group buying/coupon site is Groupon, and they are currently preparing for a launch in Australia – will they also expand to NZ? Again, only time will tell. The market does seem to be getting quite saturated however, and there is only so much consumers can handle before anything else just becomes noise in the background. Regardless on the amount of group buying sites, TreatMe appears to be launching with a deal from Burger Fuel, and if you sign up now you can be in the draw to win one of three iPhones, so at the least you might get a good burger for cheap, and who can complain about that!